Note: These instructions apply only to an iPhone 3G running iOS. If your device is running a different software version, the images may be different and other instructions may be required. To check the software version, choose Settings, General, About, Version. Click here for instructions on how to update your iPhone 3G. 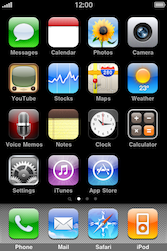 The iOS4 update installation is irreversible and may result in sluggish menu navigation on your iPhone 3G. Tango advises against installing this update. 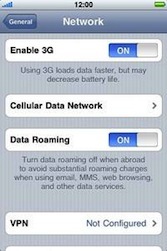 Choose Data Roaming and switch off this option.